During both the construction and operation phases, buildings generate a lot of waste and use a lot of materials and resources. This credit category encourages the selection of sustainably grown, harvested, produced, and transported products and materials. It promotes the reduction of waste as well as reuse and recycling, and it takes into account the reduction of waste at a product's source. 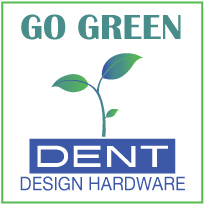 Dent Design Hardware, with a complete line of aluminum hardware, is the industry leader for sustainably harvested, produced, and transported product. No other metal is as easily recycled as aluminum. Why is this? Recycled aluminum saves 95% of the energy (and 95% of the pollution) as compared to aluminum from raw ore. 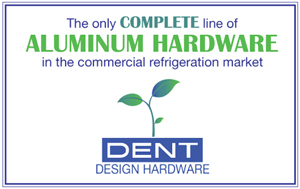 Therefore it is not only sustainable, but also cost-effective to recycle aluminum. And as opposed to most other metals, aluminum can be recycled in most towns via curb-side recycling. In fact, many town curb-side recycling programs' profitability depends critically on the aluminum content of the curbside recycling program. For metal, harvesting refers to the mining and melting/casting location. Our domestic sourcing and production insure maximal locally sourced credits for your project. The actual casting process of aluminum itself averages 30% on-site aluminum recycling and the local aluminum supplier averages over 50% recycled aluminum content. No other metal achieves nearly these levels of locally recycled and harvested content. Aluminum speaks for itself here. Why make hardware that must be 3 times as heavy to achieve the same result with competing metals such as zinc? For example, Aluminum's strength to weight ratio insures its continued use in critical airplane components well into the future. Therefore your shipping costs, in dollars and SENSE, are optimized.